Playing along with Papertrey Ink's Make It Monday #332: Petite Pattern Play. To create this A2 card I stamped the small bird image from Papertrey Ink's Feather Finery in Hero Art's Wet Cement ink, forming a square on the card panel. 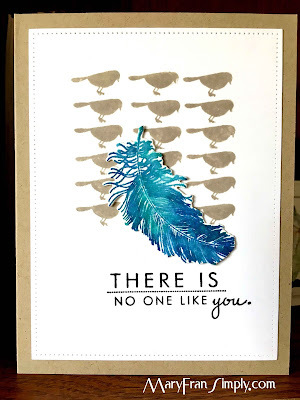 I used Peacock Feathers and Blueprint Sketch distress inks to stamp the smallest feather from this stamp set and die cut the image (I used Wink of Stella on the feather also). I used the sentiment from Larkspur and figured out placement after playing with the feather die cut, but I really like this one turned out (-: I adhered this panel to some Neenah Desert Storm used as the card base. Thanks so much for reading this. What a darling bird image to use as a bg stamp. Beautiful blue feather too! Great idea with the tiny bird and feather combo! Great card!